Larsen “is not a serious contender” and that they agree on a lot of issues. I really would like to debate the issues, but Souder will not. I dislike wasting time pointing out obvious flaws or in this case to snip, but is this not what Souder is doing? Souder says we agree on a lot of issues while at the same time infers I do not know what I am talking about. So if we agree on a lot of issues, but I do not know what I am talking about, does this mean Souder does not know what he is talking about? 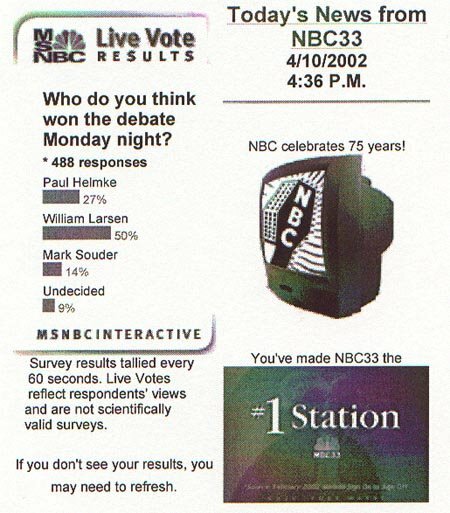 Mark Souder spoke to Prime Time 39 on 3-12-2004 and referred to Social Security as a "shell game. "He stated, "For people under 30 itsprobably going to be income based. I am not saying we're going to pass that. It will probably be passed after I am dead. "He continued "If you're 40, you might make it through the system. But if you're under 40, andcertainly under 30, you had better start planning because if you wantto have a decent retirement you’re going to need supplemental funds." Who would you rather have fix Social Security, Larsen or Souder? He knows there is a problem, yet he is doing nothing about it and he does not want hear about it. The only fix he has is to tell our children to plan on saving a lot more because SS will be income based by they time they reach retirement age. What is the purpose of a U.S. Representative? Is it to ignore the really big problems and or talk about renaming high ways? On Budget Deficits, Souder voted for the Rx drug program that willcause the deficit this year to increase by $45 Billion if not moreand add over $3 Trillion to the national debt over twenty years. It’syour kid’s future Souder is mortgaging. But why does he notcare? Pretty simple he will be dead by the time the problem sinks theeconomy. In scouting we leave a camp site in the same if not bettercondition than when we found it. I believe we leave this country isthe same if not better condition than when we inherited it. Too badSouder does not have the same moral value. Souder seems very pleased the military ordered more Humvees. They are built in the 3rd district. The problem is this. Is the Humvee the best vehicle for our troops in Iraq? Sure the Humvee is mobile, maneuverable and fast, but how does this help in the streets of Baghdad where the roads are narrow? Why not use those heavy armored vehicles sitting in the desert that were built for the cold war and now replaced by the Humvee? What vehicle would you rather be in, a Humvee or an armored half track with a 50 caliber mounted on top? Souder says he cares for veterans, yet is a conscientious objector. I am a navy veteran. I served my country. I gave blood for my country. I know what it is like to lay in a hospital bed for months recuperating from wounds received in the line of duty. I know what it is like to try and get treatment from the VA hospital in Fort Wayne as well as Indianapolis. We have over 15,000 casualties from this war. These service men and women who VOLUNTEERED will live with these wounds the rest of their lives. I will definitely support the military men and women who serve today as well as all veterans. I’m William Larsen, a candidate for Indiana’s 3rd district U.S. Representative. I’m a navy veteran, engineer, husband and father of five children. I want to restore the American Dream, where in a land of opportunity an individual can work hard and prosper. The war has created thousands of casualties; we must safeguard and strengthen our Veterans benefits. We need to restore our personal freedoms that are under attack. After 47 years of continuous deficits, its time we balanced the budget. In 2005 our representatives spent $726 billion more than we paid in taxes. It’s unfair to pass this burden onto our children. The tax code is 7,500 pages of exemptions, credits and deductions for special interests. I want to reform the tax code so it’s fair, less than 50 pages and takes ten minutes to complete the tax form without professional help. We need a 21st century energy source that is truly renewable, clean, efficient, reliable and cost effective to replace the centuries old fuel conversion process of burning. I want to return education to the states. Since 1983 social security has been working on resolving its latest funding problem. It is no closer to a solution now than it was in 1937. Social security has earned 8.6% compounded continuously since 1980, but as a middleman will pay you a 0% return. It’s a dreadful value. I propose all workers keep what was the social security old age tax paid by employee/employer in their own accounts. Wind power is making a dramatic change in the United States. In 2005 2,431 Megawatts were added to our Electrical capacity at a cost of over $3 billion. The cost per megawatt is probably close to $1.25 to 1.3 Million. For a standard 5-Megawatt windmill the cost would be about $6.5 Million. One megawatt will provide 251 homes the power they need. A five-megawatt windmill will provide over 1,200 homes the power they need. The windmill capacity added in 2005 alone will provide power to 2.3 million homes. The $5 billion ethanol tax credit paid to subsidize ethanol in one year would buy enough windmills to produce power for over 3.8 million homes a year. In ten years nearly half of all our homes could be powered using windmills. What do we get for this size of investment? How does it compare to Ethanol? After a bit of math we find that 5 Megawatts is equivalent to 1,790,292 gallons of Ethanol a year. At the current price of $2.489 per gallon of unleaded gas and the fact Ethanol has just 70% of the energy content, we are looking at an energy value of $3,580,584. Because it consumes more energy to convert the Biomass to ethanol than it contains, the cost is somewhat higher than $3.5 million. Now add in the cost of a distillation plant, maintenance and labor and it is easy to see that wind power after just two years pays for itself when compared to Ethanol. It replaces fossil fuels and the price fluctuations we have seen over the past two years. It can provide a steady income to farmers. Every farm has some portion that is not producing an economically viable product. Placing a windmill in these locations can provide income and royalties to the farmer. It is renewable, clean and cost competitive now. Further cost reductions can be achieved as wind power gains acceptance. Lenders charge a premium to finance wind farms because the view them as novel. This will change. In addition larger wind farms cost less to operate due to economy of scale. Tracy Warner of the Journal Gazette again considers me a one issue candidate. What is it with Warner? Can he not read? Is he ignorant? He calls me a one issue candidate, has Souder stated what his issues are on his web site, no? Not a single issue is listed on his web site. Is Souder a zero issue candidate? Tracy is filtering the information you get. He is not reliable in reporting a candidate's position. Freedom of the press, what a great concept. You would think the press would want to present the news as it is, not filter it, not insert their preconceived ignorance into what they write and publish. I suggest you boycott the Journal Gazette. The Good Old Boy Network is Alive!!! The Allen County Republican Headquarters allows republican candidates to place campaign material inside on tables. They also will place campaign signs in the windows. In 2004 I dropped off my material and three campaign signs. They said nothing at the time, but did not put them up. In 2006 I paid my dues and left my flyer and a few buttons on the table out front next to Mark Souder’s material. Today I went by to drop off three campaign signs. I was told my material was not allowed because it makes a “statement.” They do not allow any material that makes a statement. With this said, what then can be placed in windows or tables within the Allen County Republican Headquarters? Certainly if you have a position that has a box with a check mark, this means vote for me. Is this not a statement? Then there are the flyers themselves. Those that have issues are making statements as well. I was upset when I left carrying my three signs when I passed a young man crossing the street. By chance I just asked his opinion of my sign. Did it make a statement? His response was that I was raising an important issue and hoped I would continue to do so. Is an issue the same thing as a statement? Can a statement be an issue? First the media presents me, as a one-issue candidate meaning that Social Security is my issue. The Republican Party now says my issue is a statement. I guess President Bush would not be allowed to place his plan for Social Security in the Allen County Republican Headquarters. Campaign signs will be going up shortly. We will be starting with the "old" sign. I expect new signs by Friday and they will go up in the rest of the district. If you would like a sign to place in your yard or as I do in my rear window, let me know. If you would like to help me out by "planting" some signs around where you live please let me know. Mark Souder's Says Social Security is a "Shell Game." Mark Souder spoke to Prime Time 39 on 3-12-2004 and referred to Social Security as a "shell game." He stated, "For people under 30 its probably going to be income based. I am not saying we're going to pass that. It will probably be passed after I am dead." He continued "If you're 40, you might make it through the system. But if you're under 40, and certainly under 30, you had better start planning because if you want to have a decent retirement you’re going to need supplemental funds." Mark supports Social Security Savings Accounts. Tax-free savings is an oxymoron. We have a $8.5Trillion national debt and ran a $725Billion deficit in 2005. This is no different than you borrowing money to pay for retirement. Tax credits reduce federal income taxes; increasing the deficit. Just a reminder to all those who will turn 18 this year. If you will turn 18 by November 7, 2006, you are allowed to REGISTER to VOTE NOW!!! All who plan to vote in the Primary on May 2, 2006 must register 30 days before hand. You have until April 2, 2006 do to this. I strongly urge you vocalize this to all you know. In the Fort Wayne area, there are over 4,000 seniors. In the 3rd district there are nearly 8,000 seniors. This group if they voted would cast 10 to 15% of the vote in the Primary. All candidates were sent a questionnaire from the News Sentinel. For those interested you can read my submitted questionnaire. Want to ask Candidate Larsen a question? Enter through the Parnell Avenue Door #1. I will have handouts, yard signs, bumper stickers and buttons available for those who would like to show support. The next time you hear a politician use the word "billion" in a casual manner; think about whether you want the "politicians" spending your tax money. A billion is a difficult number to comprehend, but one advertising agency did a good job of putting that figure into some perspective in one of its releases. a. A billion seconds ago it was 1974.
b. Slightly more than a billion minutes ago Jesus had been alive. d. A billion days ago no one walked on the earth on two feet. e. A billion dollars ago was only 3 hours and 30 minutes, at the rate our government is spending it. While this thought is still fresh in our brain, let's take a look at New Orleans - It's amazing what you can learn with some simple division. Louisiana Senator, Mary Landrieu (D), is presently asking the Congress for $250 BILLION to rebuild New Orleans. Interesting number, what does it mean? Well, if you are one of 484,674 residents of New Orleans (every man, woman, child), you each get $516, 528. Or, if you have one of the 188,251 homes in New Orleans, your home gets $1, 329,787 Or, if you are a family of four, your family gets $2,066,012. Washington, D.C.!!! Are all your calculators broken???? Maybe everyone should just flood their houses, then we can all be on the "big easy" street for the rest of our lives, and forget about working, and paying taxes and all that useless stuff! I asked Mark Souder to a debate a couple of weeks ago and I have not heard back from his campaign. I am not sure why he would not want to debate, but if anyone out there in "BLOG" land can help jump start this, it would be greatly appreaciated. If you would like to see a debate between myself and Souder, write the papers, post on blogs. I need a bit of help from my suporters to move this forward. I spoke with Carroll High School Students today about my issues. This group was very observant and in the short ½ hour there was, asked good questions. We touched on budget deficits, energy, pensions and social security. I want to thank Josh for setting this up. I had a great time speaking on the issues that are very important to me and my family and I hope theirs as well. If any group would like to have me speak on the issues and/or to ask questions, please contact me at (260) 637-0741. Here is a link to the Consumer Price Index. Use this link for more detailed CPI such as food, clothing, Medical, etc indices. Interested in how Healthcare Inflation is calculated? Here is the link to annual medical care increases. Do you see anything unusual? You can specify a FROM and TO year and it will provide you data for that span. I suggest you start with 1935, the earliest data. We will discuss the rise in Healthcare costs at a later date. You might think about what is meant by "affordable healthcare"? Who Pays The FICA Tax? How many people think the only social security tax that impacts them is that which your employer withholds from your paychecks? The current social security old age tax is 5.3% each for both employer and employee. Anyone who earns a wage will see a line item deduction identified as OASIDI. The Social Security program has two separate programs. The “OASI” stands for Old Age Survivors Insurance tax and “DI” for Disability Insurance tax. The OASI tax is 5.3% and the DI tax is 0.9%. The FICA Tax is the combined Social Security taxes and Medicare tax. Medicare’s tax rate is 1.45% for each for both employer and employee. The fact is FICA taxes impact everyone even those who do not work and have FICA taxes with held. Many people believe the employer’s FICA tax payments do not affect them. Is this belief true? Company’s either make a product and/or provide a service to the consumer. The company determines the sales price based on the total cost of materials, labor, insurance, taxes, marketing, building, utilities, etc. When the consumer pays for the product or service, the company is then able to pay the FICA tax. If no one buys the marketed goods or service, the company can not pay the FICA tax. The employer is only the collector or collection point of the FICA tax, but the consumer is the one that pays it. Therefore, the 5.3% social security old age tax withheld from your wages does cost you. However, you pay the full 10.6% when you pay for goods and services. If this were not true, we could simply increase the employers’ portion of the Social Security Old Age tax to 100% of wages and we would have no problem. However, my guess would be most our jobs and services would be shipped outside the US where it would be cheaper. In 1975 I derived a formula for helping me determine what I needed to save as a percent of income to reach a particular goal some time in the future. It could be paying for college, a vacation, home or retirement. The basic problem was how to take into account inflation. If I saved a set amount each year, I would have to save a large percentage of my income in the first year decreasing yearly (as a percentage of income) as my income increased. What I wanted was a flat percentage to save that would take into account wage growth and inflation. Inflation - This is a replacement rate. It is what you escalate yearly costs by. You could use any index, CPI, Dow Jones, SP-500, Wage Growth, etc. Your projected yearly wage growth. This is another type of replacement rate. Your projected rate of return while working. Your projected rate of return while retired. The number of years to save. In this case, your current age minus your retirement age. The number of years you wish to withdraw and adjusted yearly benefit. Deficit Spending: What is the Long Term Effect? For years politicians have measured deficit spending as a percent of Gross Domestic Product (GDP). GDP is the sum total of all goods and services produced in the United States. In 2002 the GDP was around $10 Trillion with federal budget revenues of $1.9 Trillion or about 19% of GDP. This 19% includes FICA taxes collected from both Employee and Employer. FICA taxes by law cannot be used for any purpose other than to pay for the Social Security and Medicare programs. FICA taxes are loaned to the US Treasury and in return are paid interest. The Medicare and Social Security programs are about 35% of total federal spending. In addition the Medicare and Social Security programs by law cannot borrow money. Many have stated running 1.5 to 2% deficits are manageable. Is this true? Would your family budget survive having to borrow 1.5% of your income yearly? It is relatively simple for the layperson to check if this is a correct statement. A spreadsheet is ideal for this calculation. What we want to do is look at the long-term trend. Separating out FICA revenues from federal revenues produces what I call General Revenues, which are about 12% of GDP. Since Social Security and Medicare cannot borrow money, the deficit is attributed to the General Revenues. The purpose of showing both is to high light the dramatic difference between them. Politicians are misleading the American people by resorting to using Enron style accounting. It does not mater if you do not use actual GDP numbers. We are interested in the Percent cost of financing deficits as a percent of GDP and of General Revenues. I began by using 100 as my GDP. 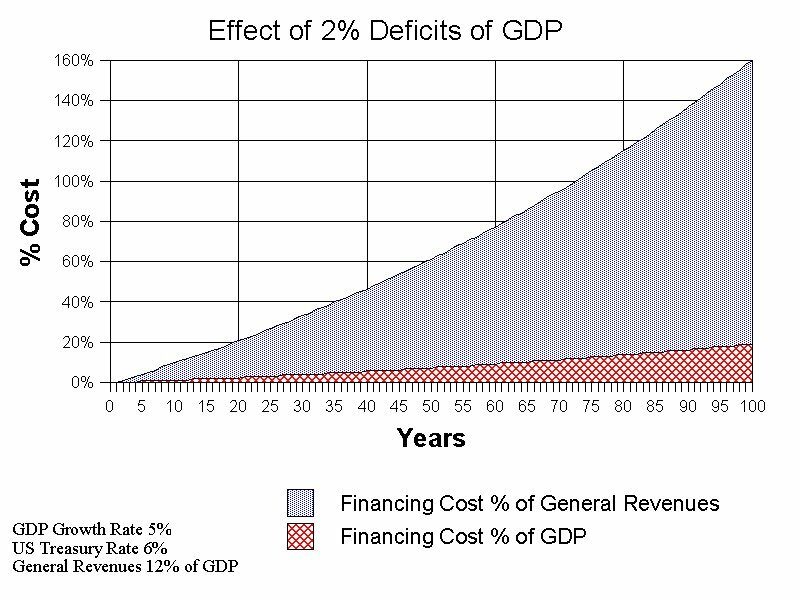 In the first year 19% revenues of GDP would be 19, a 2% deficit of GDP would be 2 and interest amounts to 0.06. Financing Cost % of General Revenues is calculated by dividing Interest on Debt by General Revenues. 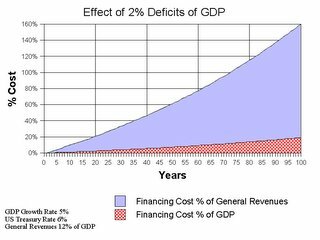 Financing Cost % of GDP is calculated by dividing Interest by GDP. The Trend is not good. Judge for yourself. When military personnel are injured in the line of duty, they go through a medical board to determine if they are fit to be retained in the military. The medical board is done prior to discharge from a military hospital. If the injury is severe, the person will be discharged with a service-connected disability. If you are discharge with a 10% rating, you are not eligible for monthly compensation, but a lump sum payment based on length of service and pay scale. If you are rated at more than 10% they can apply for monthly compensation. With the War in Iraq and Afghanistan, there have been in excess of 12,000 injuries. Many of our forces have suffered terrible injuries, lost limbs, paralysis, blindness, burns shrapnel wounds and more, which will forever change their lives. They gave themselves for our Country. Disability benefits are indexed by inflation on a yearly basis. The problem with this is very simple. A young person, such as our military personnel tend to be, have years ahead of them. Inflation adjusted benefits will only maintain that disabled veteran’s benefit with the buying power of the dollar in the year they were discharged. Inflation will not maintain their standard of living with that of the rest of society that they served and ultimately sacrificed themselves for. In simple terms, inflation adjusted benefits trap the disabled veteran with the same standard of living as when they were injured. It will not allow them to purchase goods and services that were not in their “basket of goods” when that year's Consumer Price Index was calculated. After ten years, their standard of living will have fallen by 10% behind those they swore an oath to defend and protect and after 40 years it will have fallen by 31%. These are young men and women who made huge sacrifices. I believe we owe it to them to adjust service connected disability benefits not by inflation, but by the change in the US Average Wage. Making this change will provide better compensation over their life times than the current index used. We owe them much more. This is the least we can do. Question 2. BALANCED BUDGET AMENDMENT TO U.S. CONSTITUTION asks if you will support legislation that federal outlays will not exceed federal revenues. Sure I can support this. But then there is question 3. Question 3. SOCIAL SECURITY CHOICE. This question asks if you recognize social security will default on paying scheduled benefits. That you support “Current retirees and those nearing retirement would not have any change in their Social Security benefits:” at the same time “allow younger workers to have the choice of investing much of their Social Security taxes in regulated individual retirement accounts.” Let us be perfectly clear here. The only money that social security has to spend is your money. If you support paying current and those soon to be beneficiaries, then by default you cannot possibly support private accounts. 95 cents on every dollar collected in SS-OASI taxes is used to pay current beneficiaries with this to end around 2018. Then there is fact social security benefits are based on wages and their future costs rise at the same rate as wages. there present value liability is over $16 Trillion, with assets of just $1.65 Trillion. Next we have question 4. SPENDING RESTRAINT. Here they ask if you will support a “freeze of total non-defense discretionary spending for at least the first two fiscal years beginning after the 2006 general election.” In 2005 there was a deficit of over $726 Billion in the general budget. If you support question 1 Balanced Budget Amendment, then how can you support freezing non defense discretionary spending? We are talking about severe cuts and the NTU does not recognize this. Then there is question 5. NO TAX INCREASE. This is similar to question 4 Spending Restraint. Here they ask if you would vote against any tax increase. If you support this and question 1 BALANCED BUDGET AMENDMENT TO U.S. CONSTITUTION, then you cannot support freezing current spending. We either have to cut spending and/or raise taxes and here is why. The current interest rate we pay on the national debt is approaching a short term rate of 5%. The effective rate of interest paid on the debt is close to 5.7% if not a bit more. If the growth in the economy does not grow by at least rate paid on the national debt, the national debt will grow relative to the budget. If we were running a foot race, we are falling behind yearly just maintaining current spending. Question 8. PERMANENT TAX RELIEF, do you support making the tax relief permanent? Again if you support question 2. BALANCED BUDGET AMENDMENT TO U.S. CONSTITUTION it would be impossible for a candidate to say yes to this question while at thes same supporting 4. SPENDING RESTRAINT. This questionnaire does not ask the tough questions necessary, but asks questions that are inconsistent with each other. More thought should have been given to the questions asked so that subsequent questions would not lead to contradictions or impossibilities. I believe a bit more information is needed on Ethanol. The United States consumes on average more than 400 million gallons of gas per day. The United States had 81,759,000 acres devoted to corn production in 2005. The average yield per acre was 147.9 bushels with the five year average at 142.5 bushels per acre. According to studies, you can get 2.5 gallons of ethanol from one bushel of corn. In 2005, the US produced 1.5 billion gallons of ethanol. This consumed 5.2% of all the corn grown in the US. If all corn were devoted to ethanol production, we could produce 29.1 billion gallons of ethanol. To equate this to the US gasoline consumption of 400 million gallons per day and the fact that ethanol has 70% of the energy content of gasoline; we could reduce gasoline consumption by no more than 14%. In addition if all corn were devoted to ethanol production, we would not have corn for feed or on our dinner tables. The by-products from the production of ethanol are used else where, but can the market absorb and use this amount of by product efficiently or will some of it simply be scrapped? Ethanol can show a positive energy value when an energy credit is given for the by-product. If the by-product is scrapped, any energy credit applied to ethanol for the by-product cannot be realistically counted. The energy needs of the US is very large. We need to think bigger and outside the box if we want to be truly energy independent and environmentally clean. It is far easier to drive smarter (combine trips) and build more efficient cars than to depend on ethanol as our solution to reducing foreign oil. Personal accounts are in the news these days. Many say they are the solution while others say they will worsen Social Security’s problem. What is the truth and how do you determine for yourselves? At www.nationalcenter.org/gspan.htm you can see Alan Greenspan remarks of December 6, 1996 on investing a portion of social security funds into equities. “If social security trust funds are shifted in part, or in whole, from U.S. Treasury securities to Personal debt and equity instruments, holders of those securities in the Personal sector must be induced to exchange them, net, for U.S. Treasuries. If, for example, social security funds were invested wholly in equities, presumably they would have to be purchased from the major holders of such equities. Personal pension and insurance funds, among other holders of equities, presumably would have to swap equities for Treasuries. But, if the social security trust funds achieved a higher rate of return investing in equities than in lower yielding U.S. Treasuries, Personal sector incomes generated by their asset portfolios, including retirement funds, would fall by the same amount, potentially jeopardizing their financial condition. This zero-sum result occurs because of the assumption that no new productive saving and investment has been induced by this portfolio reallocation process. Proposals call for changing the benefit formula from wage indexing to inflation indexing. You can read about this at www.ssa.gov/OACT/COLA/Benefits.html This reduces the initial benefit by about 25%. Had this change taken place in 1983, benefits would be 19% less for those retiring this year. Increasing the number of working years used in the calculation from 35 to 40 would reduce the average indexed wage, resulting in another 5% benefit cut. In addition any money borrowed to pay transition costs will have to be financed, which would raise your federal income taxes. You will earn a higher rate of return on your diverted dollars, but will now have a sizable loss on your non diverted dollars for a combined return close to zero percent. On average, proposed Personal accounts when combined with the Social Security benefit will provide no more than the current payable benefit. Personal Accounts do not increase overall savings, but simply is an accounting gimmick. Real savings can only begin with real benefit cuts now. In simple terms you cannot get something from nothing. If you are not happy with the current Social Security program, then you should be equally upset with Personal accounts. What Went Wrong With Social Security? E-85 gasoline is being promoted as clean, renewable and cheap, is this true? We the taxpayers are subsidizing the production of E-85 to the tune of 51 cents per gallon. If E-85 cost 51 cents more per gallon would it be cheaper than regular gas, no? E-85 contains 30% less energy than gasoline. When gas is $2.30 a gallon, E-85 should cost $1.66. Subtracting 51 cents, it should cost $1.15. In terms of cheaper, it fails this test. Someone is making a lot of money. Studies show that production of ethanol is an energy loss. It takes 90,000 to 131,000 BTU’s to produce a gallon of Ethanol, which has just 83,961 BTU’s. When energy credits are applied to by products produced, Ethanol is slightly positive. However, the studies do not take into account total energy consumed to support the production of Ethanol such as; building the combines to plow & harvest the grain, the energy to heat and maintain the farmer’s home, and the energy cost to build the ethanol plant. Energy credits for by products are estimated, but energy costs for the ethanol infrastructure are not. Much depends on the grain used, the grain yield per acre, method of farming and whether the grain is wet or dry prior to distillation. The bushels per acre will affect the energy balance considerably. The higher the yield per acre the more energy per acre that can be obtained. However, since we eat grains and the supply of grain affects price, there is no escaping the fact that using grains to produce ethanol will not hold down costs. If we divert those areas of the country with highest yield to ethanol production while diverting those with lowest yield to non-ethanol consumption, we will have to bring more acres into production consuming more fossil fuels to meet our feed and food needs. Did we save anything, no? It takes a distillation process to convert grains to ethanol. The energy used in this process comes from natural gas, coal, nuclear or hydro. Coal is dirty and produces acid rain; nuclear has a waste disposal problem, which after 40 years is still unresolved; hydro is the cleanest of all and renewable. In the Midwest, there is little hydro electric. Most of our electrical production is from coal, natural gas or nuclear, all non-renewable and all somewhat dirty. Though ethanol is being touted as clean burning, the production of ethanol is anything but clean. The backyard where the coal fired plant is located is being polluted more while the area the E-85 is sold will have less pollution. Rather like selling pollution credits. Energy is very important to our economy and standard of living. It affects our jobs, costs, environment and more. Burning a fuel to get work out is old technology and pollutes. What we need is a new 21st century power source, one that is renewable, clean, abundant, reliable and not dependent on others. That energy source is right in front of our faces.